Elegant, honest and very romantic, that’s how you’ll find out wedding photography. We can tell your Bellport Country Club wedding story like no one else can. Our breathtaking portraiture is sure to impress, and we won’t get in the way of your celebration. Make your dream wedding reality at Bellport Country Club. Situated in the friendly village of Bellport on Long Island’s South Shore, this venue will host a wedding that your guests will still be talking about at your 50th-anniversary party. Whether you want an indoor or outdoor wedding, or reception, Bellport offers a range of wedding facilities including an elegant outdoor terrace, a stunning golf course, a sweetly scented rose garden, and an intimate beach setting. Say “I do” in one of these perfect locations and make your dream wedding reality. Bellport will suggest a wedding menu to get you started, and you can customize it to suit your own unique style and taste. You can trust the Bellport culinary team to create only the highest quality dishes for your event. Our white glove service will add to your guest’s enjoyment of your delicious wedding banquet. The Country Club can also provide beautiful linens, centerpieces, and decorations. 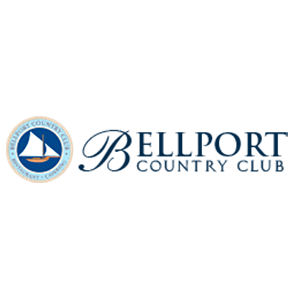 Let the Bellport take care of everything that needs to be done, to make your wedding ceremony and reception run seamlessly. The Bellport offers several locations for you to make your wedding day dreams come true. Each of the facilities will easily accommodate more than 300 guests. The cocktail room: This space is as elegant as its name suggests. You and your guests can sip on chic cocktails overlooking the surrounding tranquil waters and verdant foliage. It’s the perfect space for sharing a slow, romantic dance or watching the sunset in each other’s arms. The rose garden: Located next to the terrace, the rose garden and makes a stunning backdrop for your romantic wedding ceremony. You can also have your cocktail hour here. An endless manicured hedge of burgeoning roses will complement your natural beauty and your elegant wedding gown. We love to take photographs at this romantic location. The ballroom: This is a sophisticated wedding space with elaborate wood moldings and subtly toned décor which effortlessly lends itself to any wedding ceremony motif from traditional to contemporary. Your guests can gather around the mahogany bar to toast your happy future. The lobby: With two stories and a magnificent staircase, the lobby is a dramatic setting that provides a great backdrop for your wedding photos. You can do more than just welcome your guests here; you can invite them to dine on hors-d’oeuvres while you chat and reminisce. The classy ambiance is made complete by the elegant fireplace, crystal chandelier, and baby grand piano. We can make your wedding photography simple and stress-free. Call us today to find out more, and when we meet, you can peruse our extensive portfolio.